Creative, colorful and cute! 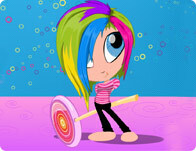 This candy loving hairstylist loves custom rainbow styles and cutting edge chic emo fashions. 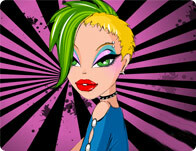 Style her up and watch the "Cool" bar rise as your styles get more unique and creative. Hair, Whatever you have resting on your head, you'll find a fun way to customize every strand. Dye, cut, and highlight with some extensions for any hairstyle! You'll always find the cool games at Girl Games, we have all the best games from game developers like i-dressup, girlsgogames and cartoon doll emporium so you will never get bored! This month we have some amazing games like Minion at Beard Salon , Elsa Frozen Real Makeover and Elsa Frozen Real Haircuts. New games are added every Thursday, so check back for all the latest free games online!